Byton, the China-based electric car startup that made its debut at CES last year, is back to show what the finalized interior of its upcoming M-Byte SUV will look like. The giant 48-inch wraparound digital dashboard screen that received so much attention is staying. And so is the touchscreen drive tablet located at the center of the steering wheel — although its size and design has changed. No, Byton didn’t remove anything. It’s adding more. 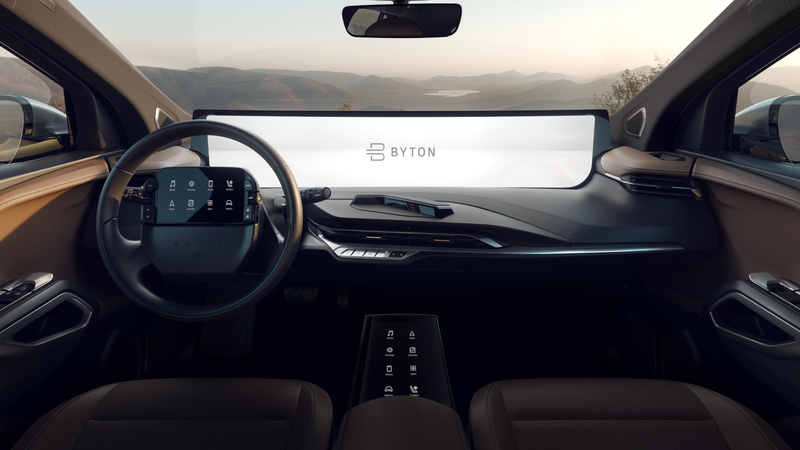 Byton is adding an 8-inch touch pad between the driver and the front seat passengers on the production model of the M-Byte, executives revealed Monday at the CES 2019 in Las Vegas. That means the electric vehicle with an estimated range of about 325 miles has one massive screen that takes up the entire dashboard and two touch pads in front — one for the driver and another that’s accessible to the driver and front seat passenger. Then there’s the independent rear-seat entertainment touchscreens for the backseat passengers. There are seven tablets in all. 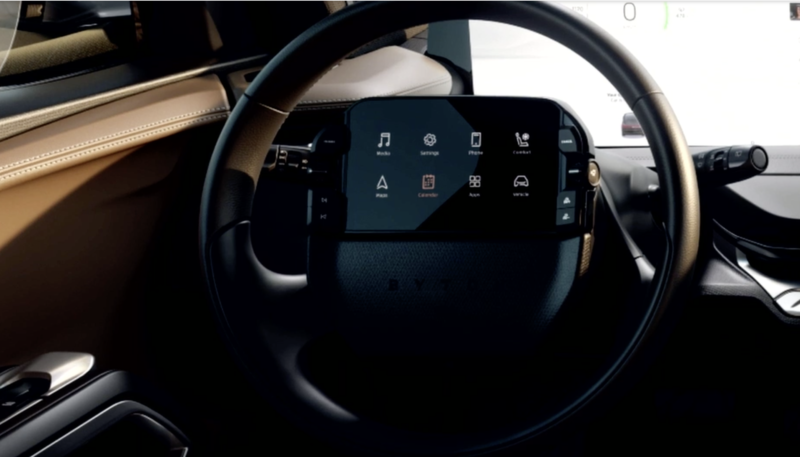 Byton did decrease the size of the driver tablet, which is at the center of the steering wheel just above the driver airbag, to 7 inches and added some hard buttons. Adding more to an already splashy and futuristic vehicle is unusual in an automotive world where automakers typically strip out these high-concept items once the vehicle heads production. There is a reason for all of these screens, Byton says. And that’s a digital cloud platform that the company calls Byton Life, which connects apps and smart devices, and of course, all that data. Each seat will be equipped with facial recognition that recognizes the passenger and driver and delivers personalized information like their schedule and entertainment preferences. It can even take health diagnostics. The vehicle will also be able to recognize voices of different users and sounds from different directions in the car. So everyone in the car can ask the vehicle to play their own music, for example. In North American and European markets, Byton is working with Amazon Alexa to jointly develop voice control. Byton is sticking with its rotating front seats that can move inward 12 degrees to make it easier interact and communicate with each other when the vehicle is not in motion. This might seem like an odd feature for a vehicle that will not be fully autonomous. It’s the kind of detail that shows up in a lot of autonomous vehicle design concepts. The M Byte SUV will not come equipped with a Level 4 system, a designation by SAE International that means the car takes over all of the driving in certain conditions. Instead, it will have come out with Level 2 capabilities, which means the vehicle has combined automated features such as steering and acceleration, but still requires the human driver to remain and ultimately responsible. The dashboard design has been tweaked as well. It now has hard buttons located in the center along with a driver monitoring system to ensure safety during assisted-driving modes. Back when Byton first revealed its SUV concept at CES in January 2018, founders Daniel Kirchert, who is president, and CEO Carsten Breitfeld said it was close to what the final production version would look like. It’s about 80% complete, Kirchert told TechCrunch back in August, adding that the prototype has modest changes from the concept, including a slight changes to the height and headlights as well as improvements to the door latches. The company, which was founded in 2016, now has 1,500 employees and plans to produce the M-Byte by the end of this year.